A kitchen asset, this planter will keep your favourite flavours within reach – and provide space for important notes, too. 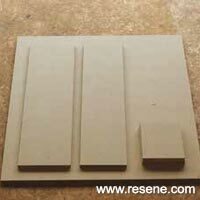 You will need: 600mm x 1200mm sheet of 9mm MDF, wood glue, 19mm x 1.6 flat head nails, Resene Quick Dry waterborne primer undercoat, Resene testpot in Resene Half Duck Egg Blue, 250ml Resene Blackboard Paint, 400mm length of twine, chalk, 50cm plastic water tray (these are actually 47cm long), 3 x 10cm potted herbs, 240 grit sandpaper, sanding block, hammer, large paintbrush, fine artist’s paintbrush, rag, masking tape, electric drill with 4mm drill bit and screwdriver attachment, saw, 2 x 40mm wood screws or 2 x 40mm screws with plasterboard anchors (optional). 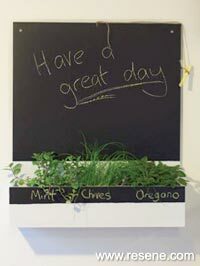 Top tip: To make your blackboard a permanent fixture, use either 40mm long wood screws or 40mm screws with plasterboard anchors to affix to the wall. 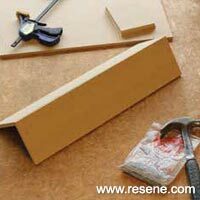 Glue along one long edge of the base and attach to the front piece. Secure with five evenly spaced nails. 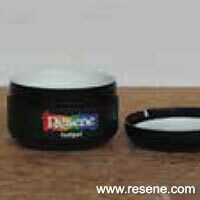 Wipe off any excess glue that may have squeezed out. 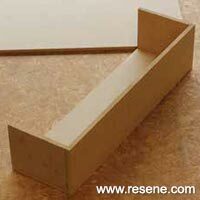 Glue along two adjoining edges of the side pieces and attach to the front and base as shown. Secure each join with two nails. 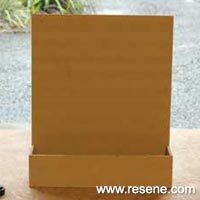 Glue along back and side edges and attach to the back piece as shown. Secure with nails. 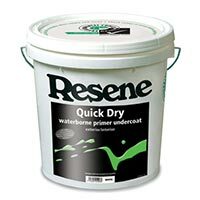 Carefully stir the Resene Quick Dry waterborne primer undercoat. 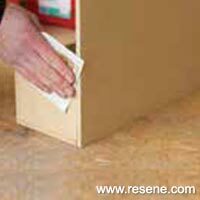 Apply one coat of primer to all surfaces, making sure the joins are well sealed with paint. Leave to dry, then lightly sand. 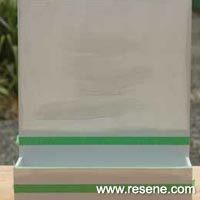 Paint the sides, inside and top edges of the planter box part, bottom two thirds of the front, and 80mm above the top of the planter box on the back board with Resene Half Duck Egg Blue. 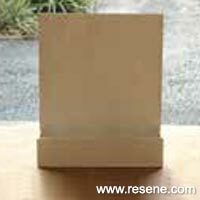 Leave to dry, then lightly sand and apply a second coat. Mask the top edges and sides of the planter box compartment. Mask 70mm up from the bottom along the front. Mask 60mm up from the top of the sides on the back board. 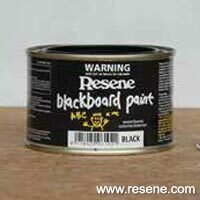 Stir the Resene Blackboard Paint. 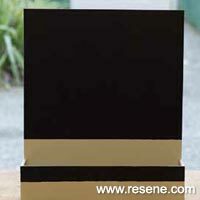 Apply one coat of Resene Blackboard Paint to the front, back board and side edges above the masking tape. Remove masking tape. Leave to dry then lightly sand. 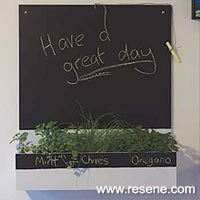 Apply second coat of Resene Blackboard Paint, leaving a small margin along the lower edges unpainted. With a fine paintbrush, carefully paint along the margin, smoothing out any bleeding that may have occurred through the masking tape. 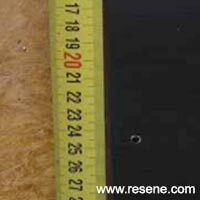 On the backboard, measure along the top edge to identify its centre. Measure 10mm down from the top, and drill a 4mm hole in the centre. 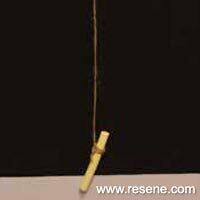 Tie one end of the twine to the chalk and thread the other through the hole, tying a knot to secure the string. 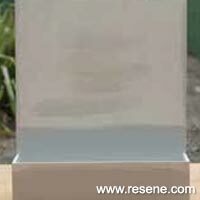 Insert the water tray into the planter box, pop in the potted herbs and enjoy.